“Traditional FISH” requires denaturation of chromosomal DNA (heat + formamide). Fluorescence In Situ Hybridization (FISH) is an important technology for localizing genes and regions of genomes but it requires some harsh conditions – notably heat and formamide to denature double-stranded DNA chromosomal DNA to allow for probe access – which can have detrimental affects on the morphology of cells, nuclei and chromosomes. Resolution of FISH localization is good but could use some improvement. Cas9 (CRISPR asssociated protein 9) has a role to play in dealing with both of these limitations. Cas9 variants including dead Cas9. Deng et al. (2015) explore the limits and performance characteristics of fluorescently labelled dCas9 (dead Cas9) in association with specific sgRNAs to detect certain loci. dCas9 was expressed as a fusion protein with a Halo tag and a hexahistidine affinity tag. 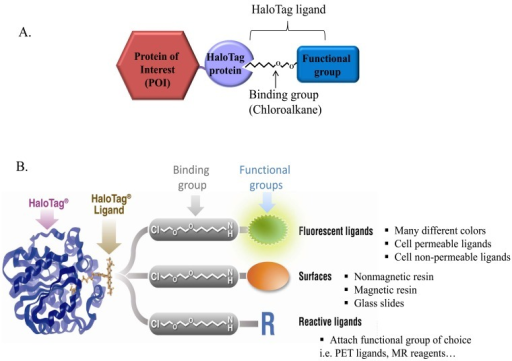 The Halo tag gives users the ability to easily label dCas9 with a variety of fluorescent proteins allowing multiplexing with differently labelled ‘probes’. This Cas9-mediated FISH method is called CASFISH. Deng et al. used it to localized highly repeated sequences in fixed human cells and obtained nice results reflecting the 3D organization of the chromosomes in the nuclei. Schematic of the HaloTag technology. One of the interesting finding reported by Deng et al is that the dCas9/sgRNA binary complex is highly stable after it is assembled in vitro. This allows one to pre-assemble multiple ‘probes’ and to simultaneously apply them to cells without worrying about significant amounts of disassembly/reassembly of the complex resulting in wrong combinations of sgRNAs and labelled dCas9 protein. CASFISH was tested against low copy repeat sequences – 45 copies of the target sequence in one case and 400 copies in another. In both cased signal could be detected in fixed cells. When CASFISH was tested against non repetitive DNA its performance was in need of some improvement. In this case Deng et al. made 73 sgRNAs that tiled a unique-sequence region of the genome of about 5kb. So, at the moment, low and high copy repeat sequences can be detected readily but unique sequences are still problematic. Finally, the authors show that CASFISH can be applied to cryo-sectioned material. The versatility of Cas9 in all of its forms continues to be demonstrated and its use for subnuclear localization of sequences in fixed cells is just the latest. Deng et al. (2015) is worth reading and while the data presented are from fixed cells, the authors feel that live cell imaging with CASFISH is possible. Deng, W., Shi, X., Tjian, R., Lionnet, T. e., Singer, R. H., 2015 CASFISH: CRISPR/Cas9-mediated in situ labeling of genomic loci in fixed cells. Proceedings of the National Academy of Sciences: doi: 10.1073/pnas.1515692112.